The Philadelphia Pen Show 2017 is now in the record books. This past weekend Adam and I packed up the Suburban along with 8 feet of refill walls, 3 large totes, and a few crates filled with ink and stuff, headed north to Philadelphia. The show was held at the Westin Philadelphia, right in the heart of town. You couldn’t ask for a better location (unless you have to park an oversized vehicle like I did). After we unloaded the truck, the bellhop was kind enough to give me directions to the public parking tower on Vine St., just a few short blocks away, which also happens to be the tower that a lot of us parked in when the show was held at the Sheraton. Gotta remember that tower next year. As I drove down to Vine St. to park the truck for the weekend, Adam and Renn enlisted the help of several bellhops to bring our precious cargo to the show. I was truly impressed with the staff at the hotel. 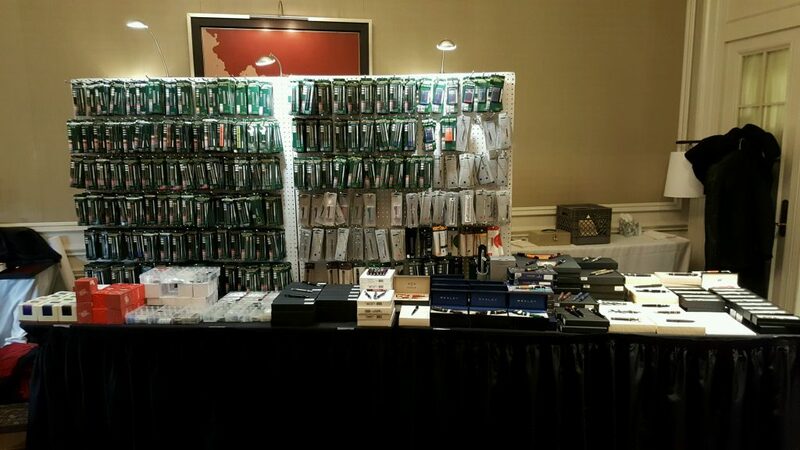 By the time we got there, most dealers had already set up – some even set up the night before. So the scramble was on to get our tables positioned, refill walls up, and the menagerie of beautiful pens that we had to offer on display. Fridays are generally a “get the table set up”, tuned and adjusted kind of a day. You really don’t expect much in the way of sales. 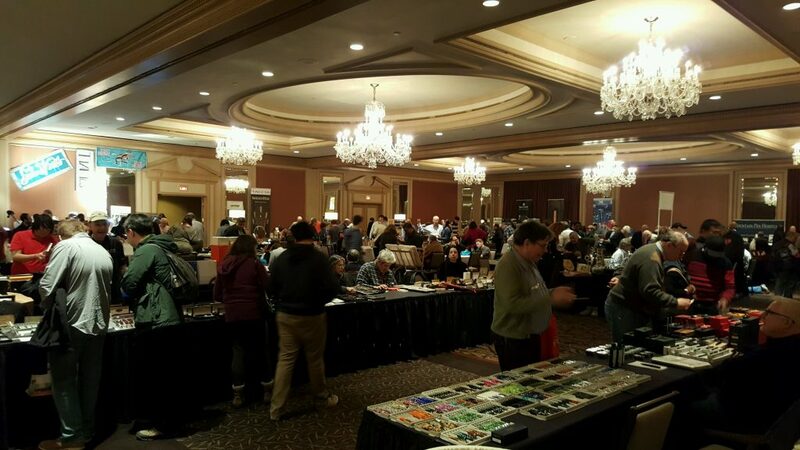 However, at the Philadelphia Pen Show 2017, Friday turned out to be quite a busy day (thankfully). I didn’t have much time on Friday to shop for pens, but before I knew it I was in the cross-hairs of Shu-Jen from Taccia. I had a feeling she wasn’t taking “no” for an answer, and I’m truly glad she didn’t because she showed me the new Taccia Spectrum Collection of fountain pens and ballpoints. The Spectrum Collection consists of 3 colors: Forest Green, Ocean Blue, and Merlot Red. There’s a very impressive line-up of nib choices for a steel nib on this one. You get to choose between Fine, Medium, Broad, and even a Music Nib (which is like a stub/italic). These fountain pens come equipped with nibs and feeds made by the Sailor Pen Co. (a highly respected brand from Japan). When selecting a nib for your Spectrum fountain pen, keep in mind that for every grade you order, it’s generally one grade finer than you’re used to (i.e. the fine nib is more like an extra fine, and a medium is more like a fine). I was very impressed with all four grades – with their smoothness and their ink flow. While not a gold nib (as most Sailor nibs are), these stainless steel nibs rank up there with their gold counterparts. 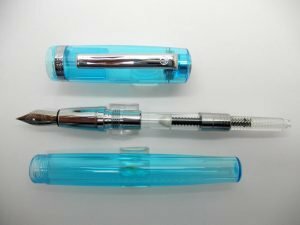 The Spectrum fountain pens use the standard Sailor cartridges and come with a Sailor converter. Friday night we were invited to join Yafa (Ken and Ross) and Kenro (Ryan and Neil) for a fine dining experience at an Italian restaurant (separate but close tables). We were promptly seated upon arrival, and soon enough the drinks were flowing. 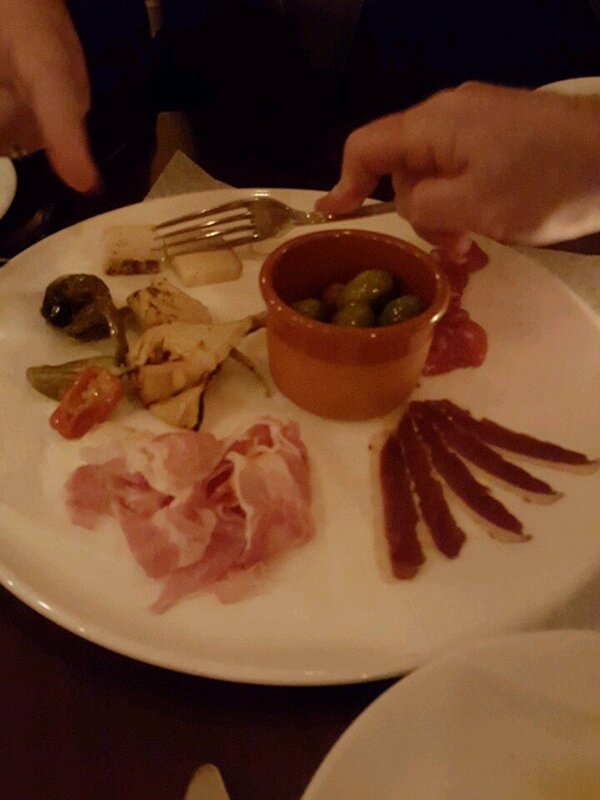 We got appetizers to share, and then we all got individual pizzas that were piping hot, but oh so good. The conversation ranged from recapping the first day of the show to the latest hockey game, to talking about my daughter Chloe singing the National Anthem at a sports game at school. It’s always great spending time with our pen friends! Before long, the food was gone and it was time to call it a night. We Uber-ed back to our respective hotels, and rested up for the big day that Saturdays usually are at a pen show. Saturday we started the day off with breakfast at the Reading Terminal across from our hotel. It was almost like being in the food court of a shopping mall, but with only local companies. Very cool. We found a diner that was open and already well under way with many hungry patrons. We ate our eggs and pancakes as quickly as possible because we were on a mission to get to the show early. The waitress gave us to-go cups for our coffee, and we were off. We got to the pen show hotel (the Westin), and everyone was busy, like us, uncovering tables and getting set up again. Soon enough the pen-hungry people started coming through the entryway. As usual, we were busy, and before long it was time for lunch, which marked the halfway point to the day’s end. 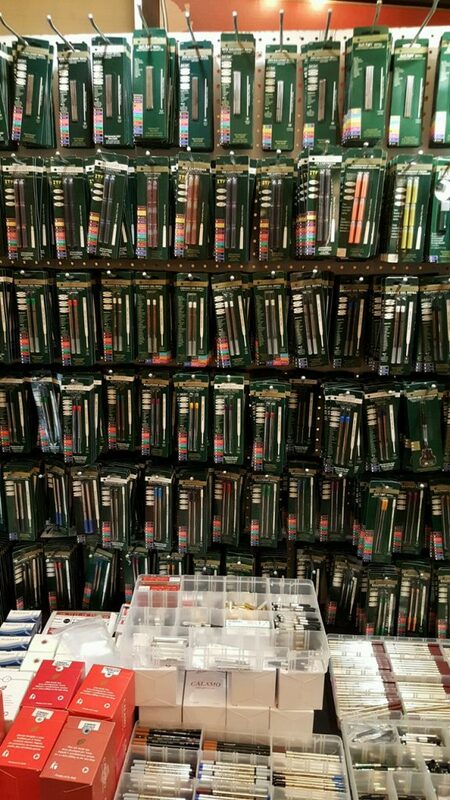 No pen show is complete without the great deals offered by Ken Jones of Yafa. The Philadelphia Pen Show 2017 was no different. Unlike most dealers, I’m always ready to get a close-out, or one-off prototypes, or odds and ends that are not in the normal lineup from a distributor. Kenny did not disappoint last weekend as I purchased quite a bounty of exceptional pens. The Monteverde Intima, Artista, and one of our favorite pens – Impressa. The Intima in pink is discontinued, which makes this a great buy since you won’t be able to get it anymore. The Artista Crystal Turquoise fountain pen (also an overstock) is the perfect starter fountain pen at an even better price. The translucent nature of this pen makes it very fun to see its inner mechanics. As always, our refill walls brought people over to our table. We brought most types of refills with us to the show to keep you writing! As people came over to see what refills we had, they’d see all the fun, unique pens that went with it. 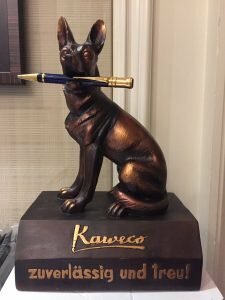 Many people even remarked about how fun it was to see the Kaweco dog statues that looked kinda like “bookends”. Some even stopped mid pen-frenzy to pose with the statues for a quick picture. Of course, once the show closed for the day, the fun wasn’t over yet. Right after, we got to be part of a select group of people that participated in an “after show social”, where we were given a ticket for a drink to go with hors d’oeuvres. Sitting and talking with fellow vendors, of course the conversation was mostly about pens. Half an hour later, a raffle started, where Adam even won a bottle of Pelikan Edelstein Ink! Then it was time to head out for dinner. Making our way through the masses outside on the street, we headed back to our hotel. The goal being to regroup and drop some stuff off in the room. On the way back out, I asked the concierge where he’d recommend that we go for a low-key place to grab a couple burgers and drinks to unwind. Instantly he pulled out his Sharpie (of all things to write with! ), and started writing slowly and methodically onto an index card, what must’ve been a carefully rehearsed set of directions. The whole time, as he oscillated his gaze between looking at us and looking out into the lobby, it seemed as though he was checking to make sure no one saw him sharing this carefully guarded secret establishment. Of course I’m paying attention to his impeccable handwriting, and how silent the Sharpie was, as he wrote upside-down and left-handed. Very impressive to say the least. After thanking him, we wanted to walk to the restaurant and really enjoy the nice, crisp, cool air. When we got there, it was definitely not the type of establishment we were looking for. You could hear the music blasting so loud that we could feel the bass reverberating through the sidewalk. Not somewhere to enjoy a conversation. We walked around a few more blocks, and went into the least crowded place we could find. We still had to yell to hear each other. It was a loud bar, but the food was great “bar food”. After several appetizers and a Shepherd’s Pie, we were exhausted and called it a night. Sunday, the final day of the Philadelphia Pen Show 2017, we powered up with the hotel’s breakfast buffet. The Reading Terminal was still closed. Making one final sweep of the hotel room, we brought all our stuff to the pen show. We made quick time of setting up for the day. 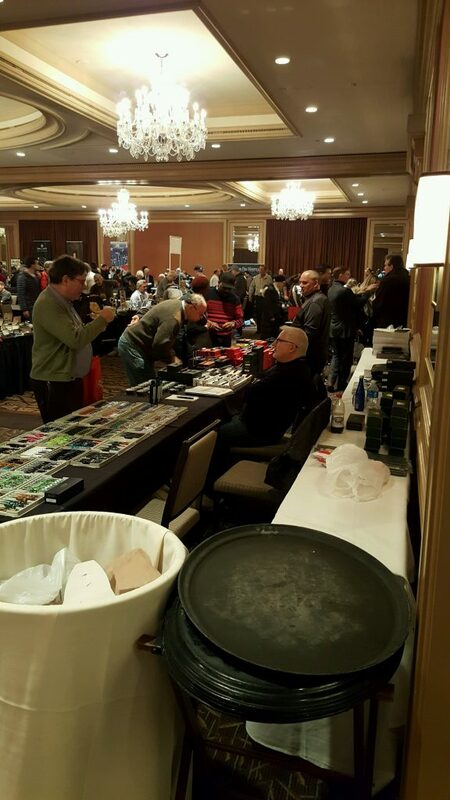 As with most Sundays at a pen show, it was a slow start for people coming in. We were ready to help bring even more deals to customers, as Ken brought a bunch of Hugo Boss ballpoint pens over to our table. Before long, it was almost time for the end of the Philadelphia Pen Show 2017. We started packing up around 4pm, and Adam guarded the totes while I went to get the truck. The bellhops were as helpful loading everything back onto the truck as they were unloading it at the start of the show. The return trip was underway. We got back to the store and quickly unpacked the truck. Then it was time for our traditional post-show meal. This time we went to Mamma Lucia’s in Olney, MD since our traditional “joint” was packed with football fans. Well, that’s a wrap for the Philadelphia Pen Show 2017. Congratulations to Scott Franklin and Franklin-Christoph for continuing this great show. See you in Philly next year! And I’ll see you even sooner in March for the Baltimore Washington International Pen Show. Stay tuned!